HELLO, T w/ T readers! No, I have not forgotten you. First, I want to thank everyone who submitted song suggestions for my travel playlist. You inspired me to download some new tunes, and I will surely take your suggestions with me on my next adventures. I’ll update the playlist as soon as I have a chance. Until then, feel free to keep the music ideas coming! As some of you know, my life has been a bit of a whirlwind lately… And the chaos has only just begun! I’m constantly buzzing around and am CRAZY nonstop busy with a task-list that seems endless. BUT, it’s all exciting. I got back from an exceedingly long trip from Italy Sunday evening (flight was delayed 2 hrs, then took 9.5 hrs, then we waited 45 minutes on the plane for a gate to open up at the overly busy JFK terminal, then another 45 minutes for our stuff, and then an HOUR for a cab from the airport, which was followed by a bit of Easter Sunday traffic). Sitting on a plane for 10 hrs (I was seated in the middle of the middle — this is what happens when I don’t book the ticket myself! I’m an aisle girl, through and through!) during the daytime is not exactly my dream come true, but it was a pleasant enough flight. I watched 3 movies, including the not-smooth transition from Precious (yep, I cried just a drop or two) to Paranormal Activity, which I actually enjoyed not paying for and watching on a plane full of people. Hehe. Between landing Sunday evening (on Euro-time… I was exhausted!) and now, I have spent a good portion of every day waiting for someone to call my crumpled up three-digit number at the Ecuadorian Consulate in midtown. Sitting in a room full of Ecuadorians is a good little preview of what’s to come. For starters, at 5’9”, I could estimate that I am an average of two feet taller than most Ecuadorians (and I was the only “white” in a room full of 50-100 tan people with jet black, slicked back hair – although I don’t feel totally WHITE, but whatevs), sometimes even with two standing on top of each other! Maybe it’s because of the altitude in Quito that these people are all so low to the ground, but it’s kind of cool… Hehe. I don’t know. I was trying to learn more about the Ecuadorian culture, perhaps some tidbit that would explain their indigenous features (the straight, downward pointed nose, short bulky stature, small limbs, and tiny hands), but all I got was an Ecuadorian DVD about a tribe in the north that has some ritual where the members of the tribe puke all their food up into one big delicious bowl of slop. Needless to say, neither I nor the real Ecuadorians in the room were enjoying the entertainment provided by the consulate. Speaking of, I have to head to the Ecuadorian Consulate now (it opens at 8am) to HOPEFULLY pick up my Visa and passport, which I need by Friday because on Monday I am off to Argentina! See what I mean? I’m scrambling to take care of big things in the cracks of major trips! I’ve barely even thought about Argentina, I’m so obsessed with Ecuador right now, but it’s time to switch modes. Oy. Another 10-hr flight awaits… and another adventure. Time is WHOOSHING by! But birds are chirping, New York City is completely blooming, petals are flying everywhere, I smell cherry blossoms and magnolias in the street air, and the city is just bursting with happiness right now. I LOVE THIS WEATHER. I’m going for a bike ride along the Hudson River every day, and hopefully I’ll squeeze in a row on the Harlem before Monday. I might be busy as heck, but I’m definitely out there smelling the roses. I promise. Now, to get us (me) in the South American mood, here’s a Mystery Snapshot from a South American country. Tell me what you see, more specifically where it is located (what country or countries -HINT- it might capture), and what you know about this place…. That was too easy! Cataratas del Iguazú. 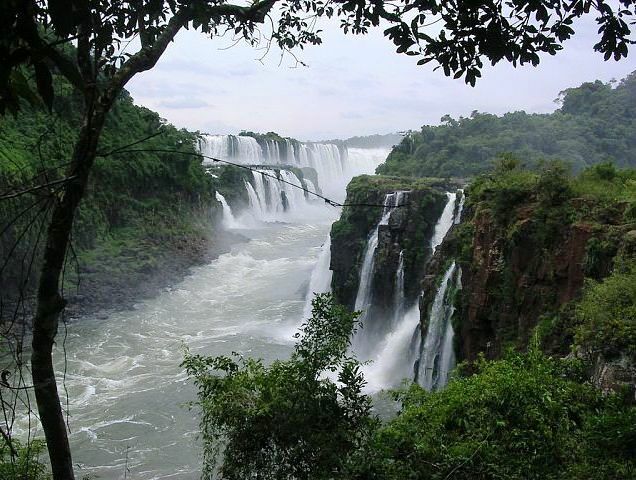 BTW, What do you thing Iguazú means? I think it’s in Guaraní.